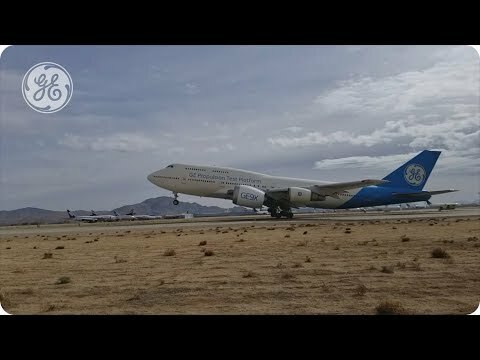 "Heading early in the morning to a small airport in the middle of the desert (Victorville, South California, GE Flight Test Operations), wearing your suit and boarding a 747 to test in-flight an engine that just 2 years before existed only on drawings and that you contributed (in a small way) to build, is an unforgettable experience." Flavio Caciuffo is the Radial Clearances Designer of the Low Pressure Turbine (LPT) of the new GE9X engine and a couple of months ago he had the fantastic opportunity to be part of the team that performed the in-flight tests on board GE Aviation's experimental Boeing 747. His task was to monitor the behavior of the turbine, particularly the variations in clearance between the rotor and stator, during different flight conditions. Flavio has been working in Avio Aero since 2013, immediately after graduating with a degree in Energetic and Nuclear Engineering from the Polytechnic University of Turin. In 2014, he was one of the first to join GE's Edison Engineering Development Program (EEDP). Flavio, how long have you been in this role and what is your job? "Since 2014, from the start of the New Product Introduction program. My job is to verify clearance between the rotor and stator, to ensure the performance optimization and integrity of certain turbine components under operating conditions at maximum power. In addition to this role, for just over a year I’ve also been coordinating the entire instrumentation activity of the LPT modules of the GE9X engines under development, from initial design to application of the sensors on the turbine parts. I work in the Design Engineering - Turbines team." Tell us about your experience in the United States. Not everyone has a chance to be part of the on-board test team...How did this opportunity come about? "To be honest, it came about by chance (smiling, ed.). A colleague from the GE Aviation team, who does design work complementary to mine and who followed much of the FTB (Flight Test Bed, ed.) testing campaign, had to go home to his wife who was coming to the end of her pregnancy. I was asked to cover his role for a few days, alternating with other colleagues at GE Aviation and at Bangalore Engineering Center." When are the test flights carried out? "During these campaigns, called Flight Test Bed, flights are made on alternate days. On days when you’re not flying, the aircraft is returned to the hangar, where maintenance or inspection can be performed if necessary. Flight days, though, always begin with a pre-flight briefing, together with Nate Kamps, the Test Director, the pilots, the System CE (Jay Gwinn) and the crew, during which the sequence of tests scheduled for the day is outlined. Crew members are also reminded of the standard procedures for safety and interaction with pilots, including requirements to maintain a certain speed or decelerate or even switch off the engine if any anomaly is detected. I made two flights of about 7-8 hours each, on April 24 and 26. On boarding for the first flight, I received safety instructions (in addition to those already given in the videos and documents I had to study in the days running up to the test) and finally I was able to experience the thrill of opening the emergency door (only for testing reasons, of course)! On board you’re all equipped with headphones, which put you in communication with the pilots and the entire crew. It’s like being in an action movie. During the test phases you’re not directly involved in, you can get up, have a snack. There are even sweet and savory snacks on the plane, as well as cool drinks. And when you look out the window, you can see Death Valley right below. What was your role on board? "My main role on board was to monitor the trend of radial LPT clearance measured during different flight conditions. Together with Jason Holden, my colleague from Aviation who was doing the same thing but for radial clearance of the High Pressure Turbine, and who was my tutor at the time, we made sure that everything was working at its best. Every single electronic and mechanical part of the component we were responsible for." Let’s talk about the aircraft... what engines does it have, how is it set up inside, what special features does it have? "The aircraft is a Boeing 747-400, equipped with three CF6-80 engines plus the fourth engine - in an internal position on the left wing - which is the one tested from time to time. In this case, it was the great GE9X. The interior of the Boeing 747-400 has been dismantled (except first class, which they left intact), replacing the seats with digital data acquisition systems and screens to monitor engine parameters in real-time during flight. The previous model was a Boeing 747-100, similar to the newest 747-400 I went up in." What impressed you most about this fabulous experience? "The importance that is given to the discipline that I deal with! During flight, before performing certain maneuvers or operations that may impact the distances or spaces between the internal parts of the turbine, the pilot or other crew members explicitly request the ‘GO’ from us, the Clearance Designers, by radio before continuing. For example, as I said before, when the pilot accelerates, a Clearance Designer can even ask them to stop accelerating or decelerate if technically required! For me it was a truly fascinating, almost surreal experience." What is the most challenging aspect of your work and your main mission? "To date, the most exciting thing for me is to see the turbine that we designed, built, assembled and tested actually in flight. And through these tests, understand what we were able to predict analytically, what already works well and what could still be improved. More generally, what I like most about my work is the idea of contributing even a very small part to the development of the GE9X, an ultra-high technology project, which will have a considerable global impact once it’s on the market. Do you have any advice to give to colleagues who would like to try similar paths to yours? "Never be afraid to tell your manager your interests, even the most ambitious ones...because sometimes they come true!" A surprising thing or passion that colleagues, or people who know you, maybe don't know about you? "I love water-based activities like fishing - traditional and freediving - and snorkeling. And then I also have more common passions like football, skiing and travel."